Personal fall arrest systems are causing cages to go out of vogue with OSHA. As of November 2018 they will not count as fall protection on new fixed ladders and they will only count as fall protection on existing ladders until November of 2036. 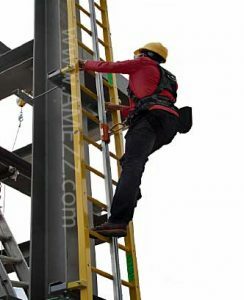 Note that if an existing ladder is modified at anytime, that modified section of ladder must be retrofitted with a personal fall arrest system at that time. We now carry a rigid fall arrest track that, when used in conjunction with a trolley and body harness, will meet OSHA’s new requirements for fall protection. The rigid track and trolley allow the climber to move freely up and down the track without needing to push, pull, or even touch any part of the fall arrest system. Should an accident happen, your foot slips or you fall, the trolley on the fall arrest system will automatically lock onto the rigid rail, stopping your fall. Tracks are available in 316 Stainless Steel or Aluminum with an anodized finish. The trolleys are designed for a single user and have a capacity of 310 lbs. Note: Two users are permitted to use a single track when used for rescue purposes, but never the same trolley. With that in mind, we suggest the single track and two harnesses and trolleys. One track/trolley may get you by for most things, but if you ever need to have more than one person on the roof at the same time you will need to have a harness and trolley for each climber. If you do not, the first climber has to get to the roof, remove the trolley and harness, lower it by rope to the lower person who then has to put on the harness and climb up. Likewise, when work is done, one person has to climb down with the harness and trolley and then remove it, tie it to a rope for the upper climber to pull up, put on the harness and climb down… It doesn’t make much sense to us either. 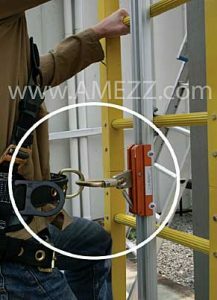 Close up view of A-Mezz personal fall arrest systems utilizing rigid track. The rigid tracks are installed in the middle of the climbing side of the ladder rungs. The fall arrest system clamps around the ladder rung every 4’ to 6’ to secure and can have multiple pieces of rigid track spliced together to accommodate long climbs without requiring a single long rail to be shipped, which saves on shipping costs. Often the increased cost of the system is offset almost entirely by the fact that the ladder does not need to have a cage anymore. Cages are costly to manufacture and especially to ship. Taking up 4’x4’x34’ of space on a truck isn’t cheap. We have seen some freight costs come back almost 1/7th what they were compared to caged ladders. This entry was posted in Elevated structure, ladders and tagged fall protection, ladder, OSHA on June 30, 2018 by Brett.